Are you planning a fishing trip with your buddies? Do your weekend plans include setting sail on the open seas with your family and friends? Whatever your plans may be, if you’re going to be traveling on a boat, you want to make sure that you invest in a marine VHF radio. In the event that you are stuck in a storm, you hit rough waters, or any other emergency happens, a marine VHF can be used as an emergency radio, as you can use it to send out signals for help. Plus, it can be used as a weather radio, and simply for communicating with other boaters. To learn more about each option, read through the following reviews. 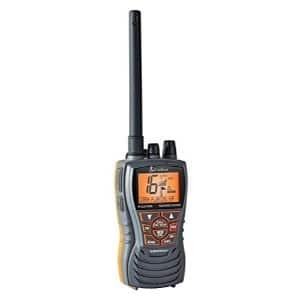 Once you decide on a marine VHF radio that you think will best meet your needs, click on the yellow link to find the best prices currently available on Amazon. The first option on our list of the best marine VHF radios is the Standard Horizon GX1700B Standard Explorer GPS VHF Marine Radio. If you’re looking for a device that can be permanently mounted to your vessel (like a CB radio for your car), than this is a great option to consider. Offer a wide range of features, this marine VHF radio will let you know exactly what your position is on the open sea, allow you to communicate with other boaters, and send out emergency signals in the event that you are in distress. It features an internal 12 channel GPS, which is built directly into the front panel, so you won’t have to worry about wiring the radio to an external GPS or DSC device. It offers DSC calling, position sharing, and waypoint navigation. You can also make navigation to DSC distress calls, which can be done in just a few easy steps. You can also input and save up to 100 waypoints, which you will be able to choose and navigate via an easy to read navigation compass display, which illustrates the SOG, COG, BRG, and DST of your vessel to the waypoint. This device is also super compact and lightweight, so you can easily mount it to a boat of any size. It can also be submersed in water for up to 30 minutes without being damaged. 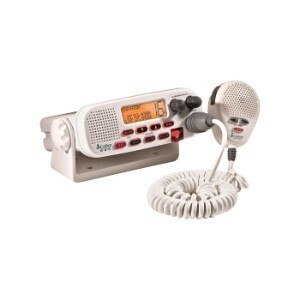 As for communication, this VHF radio features a noise cancelling microphone and has access to all marine VHF channels. There’s also a NOAA weather channel and alert; if inclement weather should enter your area, the alert will instantly sound so you can make proper accommodations. Final Verdict: The Standard Horizon GX1700B Standard Explorer GPS VHF Marine Radio will keep you and your crew safe and secure when you’re on the open waters. It offers all of the features that you could possibly need; plus several additional features that make it incredibly easy to use. If you’re in the market for a marine VHF radio that functions as a handheld two-way radio, than the Standard Horizon HX870 Floating 6W Handheld VHF with Internal GPS is definitely an option that you should consider. This device is handheld, which allows for portability; you can take it from vessel to vessel, if you’d like. It also offers a variety of features that will certainly make you feel very safe when you are out on the open weather. This marine VHF radio features a built-in GPS that automatically detects the position of your vessel and instantly sends it out to rescue teams if you should run into trouble; talk about feeling secure when you’re on the open seas. It offers great range, so you’ll have no trouble communicating with boaters near or far. This radio is JIS8 certified, which means that it is completely waterproof; it can be fully submersed under water and it won’t be damaged. It also floats and a strobe light instantly turns on if you do drop it in the water, so you can easy retrieve it. Featuring a 2.5 inch display, you will be able to easily read all of the information presented on the screen. The menus are very intuitive, so it’s easy to use; plus, it features noise cancellation technology, so you won’t have to deal with any static that can distract from your transmission quality. Final Verdict: The Standard Horizon HX870 Floating 6W Handheld VHF with Internal GPS is the perfect option for boaters that are looking for a portable device. You can take this radio from boat to boat and it will instantly detect your GPS coordinates and send them out if trouble arises. It’s also fully waterproof, it floats, and a strobe light automatically turns on if it falls in the water, so you can easily retrieve it. 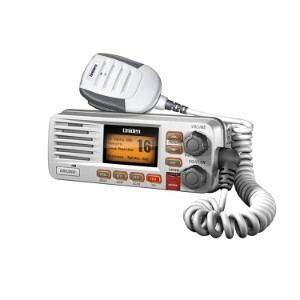 Next up on our list of the best marine VHF radios is an option that comes from Uniden. This manufacturer is highly regarded in the electronics industry, as all of the products that they make are exceptionally designed and are outfitted with the latest technologies. Some of the products that they offer include business two-way radios, hunting two-way radios, long range walkie talkies, and mobile ham radios. Their UM380 25 Watt Fixed Mount Marine Radio certainly lives up to the Uniden name. This fixed mount two-way marine radio offers a short chassis design, which means that you will have no trouble installing it into your vessel, no matter how small it may be. It’s JIS4 certified, which means that it can be submersed in water without getting damaged, which is definitely key for a marine VHF radio. The Specific Area Message Encoding (SAME) weather alert lets you know when severe conditions are moving into your specific area. Other notable features include a tripe watch feature, a memory channel scan for easy connectivity, a hi/lo power switch, and the ability to assign names to all of the marine channels that you save. Thanks to the backlit keypad and display, you will have no trouble seeing this marine VHF radio in any type of lighting. Final Verdict: The Uniden UM380 25 Watt Fixed Mount Marine VHF Radio is durable, feature-rich, low-profile and easy to install. With this device, you will certainly feel secure when you’re out on the open water. With the COBRA MRF45D Marina Radio, you will literally be able to do it all! 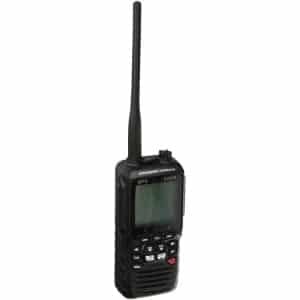 This marine two-way radio is outfitted with every feature that you could possibly want or need, so you can have confidence knowing that you will be safe and secure with this fixed mount VHF marine radio in your vessel. Featuring Class Digital Selective Calling, this radio instantly sends out distress signals with just the touch of a button. You can quickly and easily send for help and share your location with other vessels or stations so that you can get the help you need. Another awesome feature of this radio is that it offers both short and long range communication capabilities; you can choose either 1 or 25 watts of output; whichever option works best for our needs. There are a total of three channel maps, which offer access to US, Canadian, and international waters. With 10 NOAA weather channels, you will be able to say ahead of any storms that may be coming your way; plus, if a sudden storm moves into your area, the NOAA weather alert will sound, so you can make proper accommodations. This device is also JIS7 certified, so it’s fully submersible. Final Verdict: With the COBRA MRF45D Marine Radio, you can have confidence knowing that you will be safe when you’re out on the water. It features short and long range connectivity, it’s fully submersible, and it offers a range of other features that will keep you well protected. The last option on our list of the best marine VHF radios is a long range two-way radio from Cobra. Their MRHH350FLT Floating VHF Marine Radio is a handheld unit that is fully submersible and floats on the water, so if you do drop it in the water, you can easily retrieve it. This device offers three power options: 1, 3, and 6 watts, so you can use it for short range or long range communication. Choose 1 watt to conserve battery power and opt for 6 watts when you need to connect over greater distances. With NOAA weather channels and weather alert feature, you will be able to stay aware of any severe weather that may be moving into your area. Other notable features include tri-watch, which monitors up to three stations at once, and noise cancellation, so you can enjoy clearer communication. Final Verdict: The Cobra MRHH350FLT Floating VHF Long Range Marine Radio is a great option for anyone who is looking for a lightweight, waterproof, and floatable VHF marine radio. It offers all of the standard features so you can stay connected on the open water. For boaters of all types, a marine VHF radio is an absolute must. These devices can literally save your life in an emergency; plus, they let you communicate with other boaters so that you can find out the latest news and information. 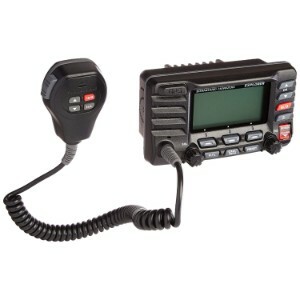 It goes without saying that you want to invest in the best marine VHF radio possible. To do that, you’re going to want to take the following factors into consideration. Handheld or fixed. There are two types of marine VHF radios: handheld and fixed. Handheld units are great because they’re portable; however, if you want better range, a fixed mount radio is a better option. Since it’s going to be on the water, you want to invest in a VHF marine radio that is waterproof, otherwise it’s almost guaranteed to get damaged. The longer the range, the more boaters you will be able to communicate with; however, do keep in mind that longer range means shorter battery life. NOAA weather channels and alert. It’s important to stay aware of the water when you’re sailing, so you should definitely invest in a radio that features NOAA weather channels and alerts. By taking these factors into consideration, you will be able to invest in a high quality marine VHF radio that will keep you safe when you’re out on your boat. All of the marine VHF radios that are featured in our review are high quality, reliable, and boast all of the features that you could need to stay safe when you are sailing. If you opt for one that isn’t on our list, make sure you consider the features that have been mentioned above to ensure that you are investing in a quality marine VHF radio that will offer reliable connectivity and will be able to withstand the weather; plus, you want to make sure that it allows you to easily communicate with other boaters and stay ahead of the any severe weather that may come your way.